There is something inherently soothing and cool about gray and cream interiors. This color combination is a mix of cool and warm, giving any room a luxurious appeal. Have you ever walked into a room and felt enveloped in a clean, sophisticated luxury? Here are a selection of cool and sophisticated gray and cream interiors for your inspiration. 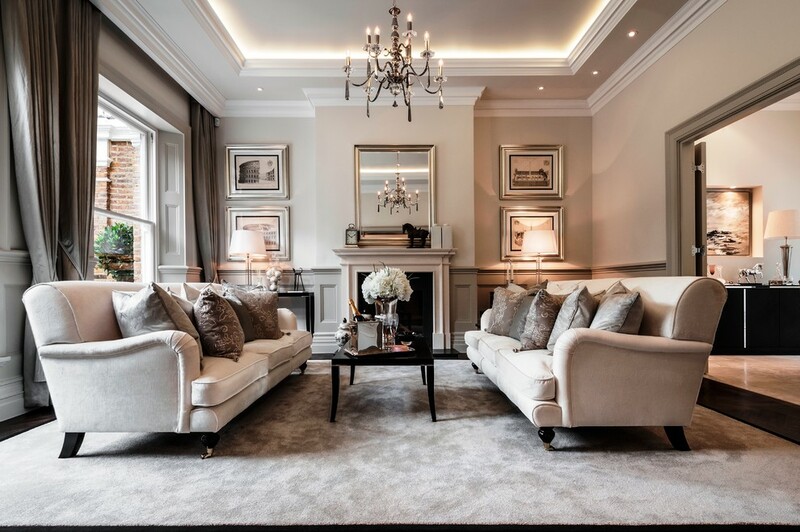 At once warm and sophisticated, a living room that deftly combines soft gray with tones of cream balances nicely. The end result is a space that is inviting and fresh. These two colors blend together with a subtlety that creates a luxurious appeal. 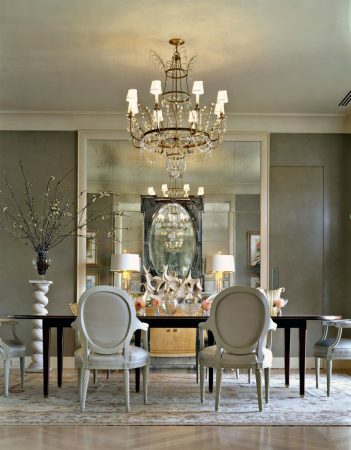 Shimmering mirrors and gold fixtures stand out against satin-finished walls of gray to lend a formal air to this dining room. 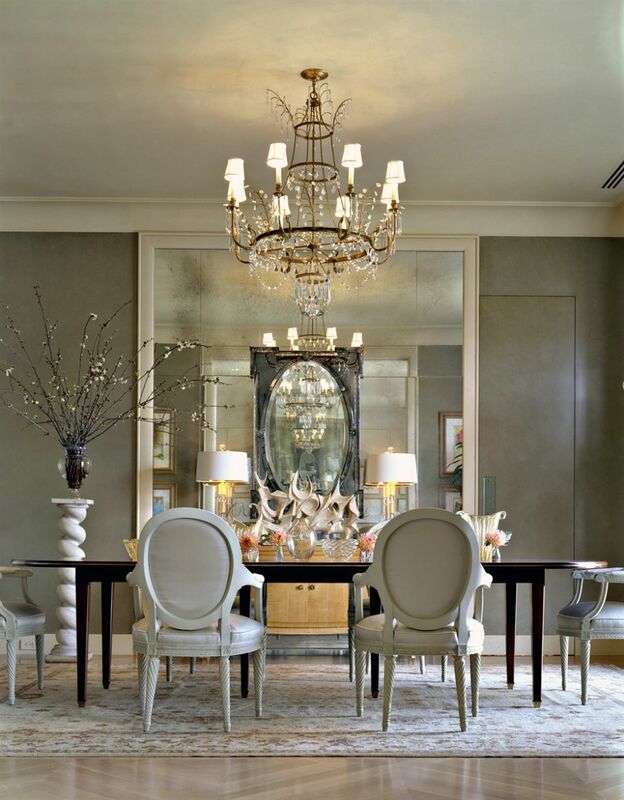 Soft and elegant, this room invites guests to sit and linger. 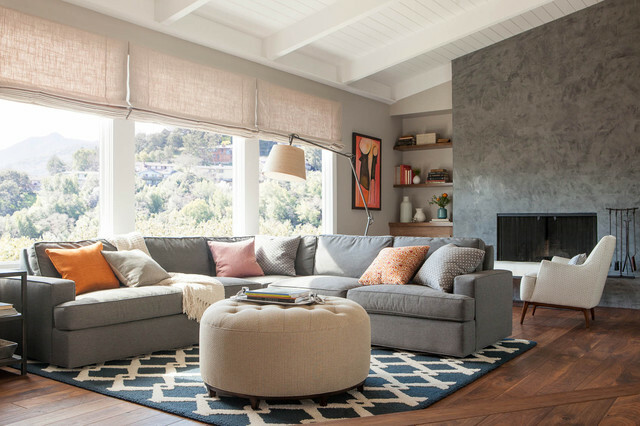 This contemporary space is anchored with a gray sectional sofa. 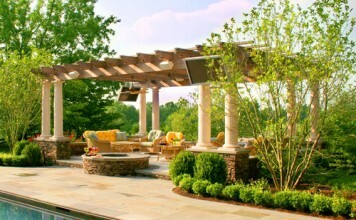 A cream ottoman and soft linen shades add warmth, while the gray stone fireplace wall provides a contrast of texture. 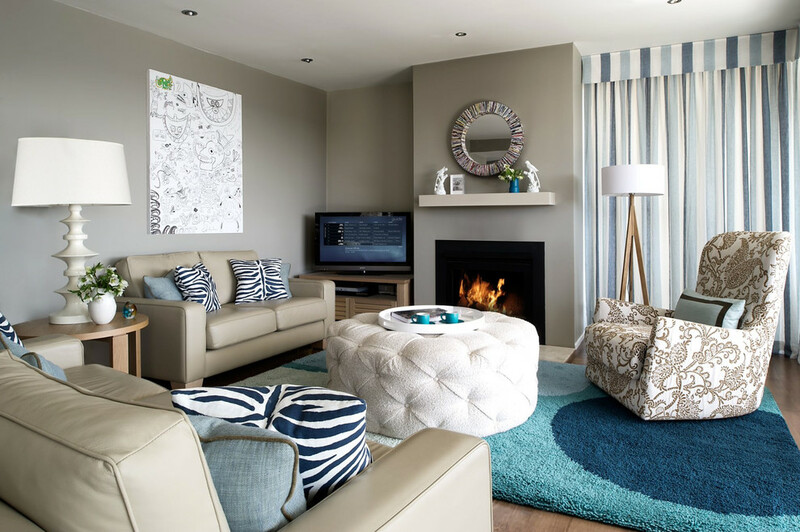 A blue and white geometric rug defines the space and offers a splash of color. Soothing and calming to the eye, the neutral palette of gray and cream exemplifies grace and light in this living room. 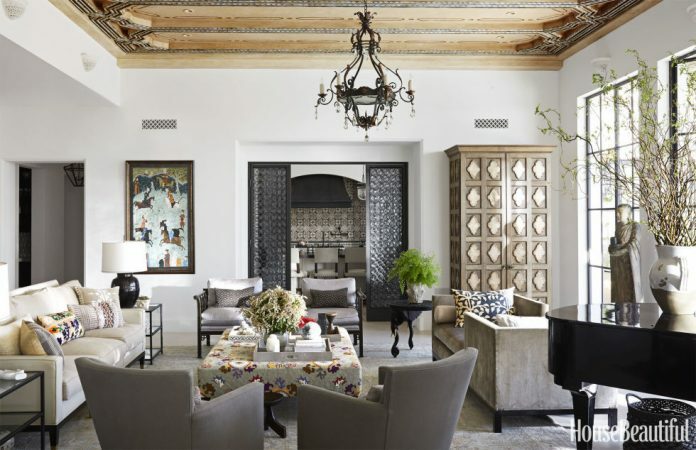 This space is the perfect balance of warm luxury and cool sophistication. Tones of beige and gray create a soothing bedroom. Splashes of gold complement the palette and add warmth to the space. The artwork and padded headboard give the room a focal point. By placing these against a gray wall panel, the pops of gold add dimension and give the room visual interest. 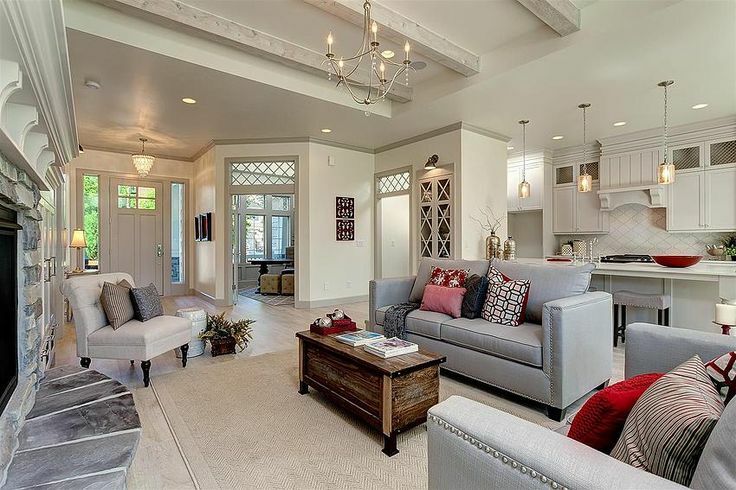 This clean and sophisticated model home demonstrates the power of neutral interiors. The gray walls and ceiling are highlighted with bright white trim and cabinetry in the kitchen. Cream colored slipcovers or upholstery would boost the warmth in this room further. 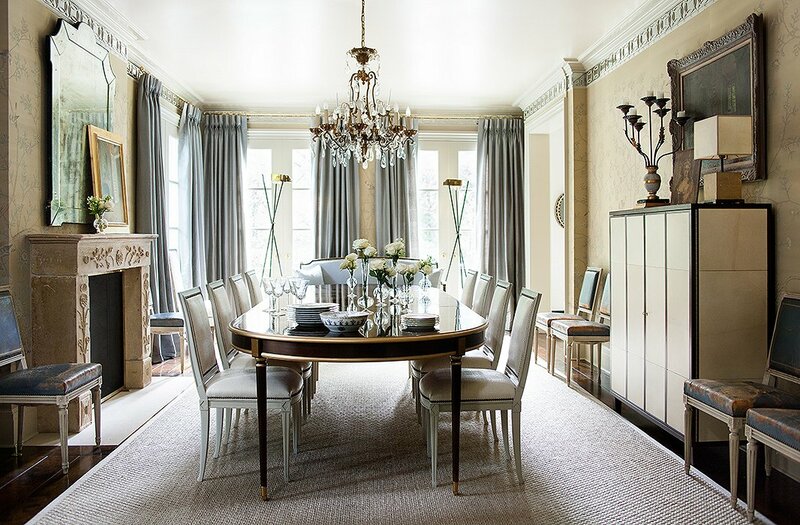 This dining room exhibits a lustrous combination of cream and silvery gray to raise the style and formality. Wallpaper, furnishings and accessories glow with warm cream tones while the floor to ceiling window panels embrace the room in gray formal simplicity. 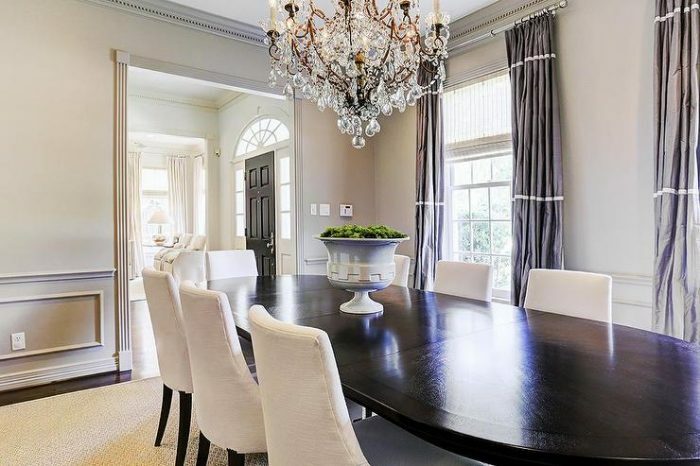 This dining room is the epitome of simple sophistication. Satin gray window panels take on a contemporary note with a horizontal band of white. 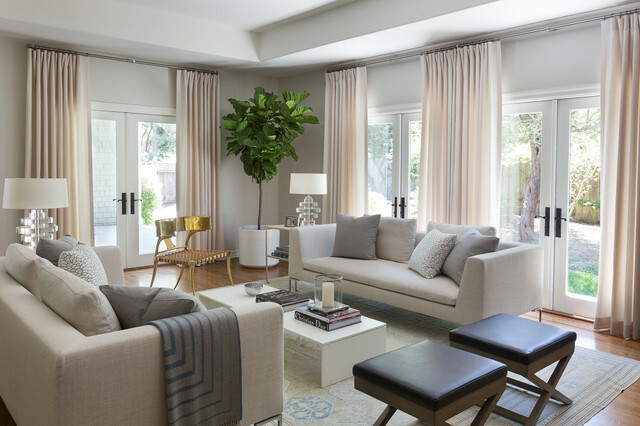 The cream walls, upholstery and rug wrap the room in soothing and fresh style. 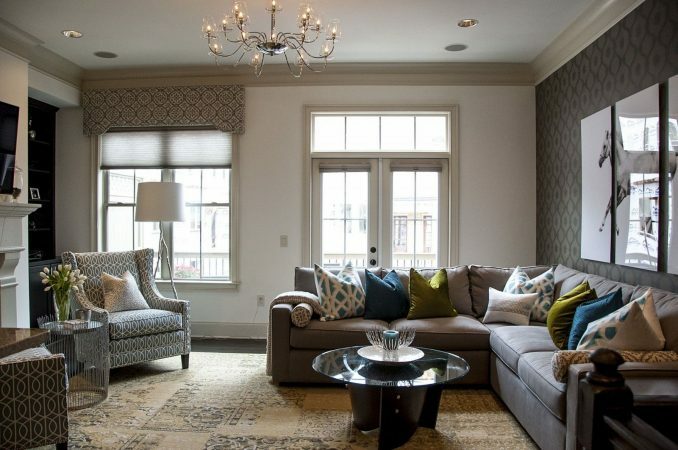 Cream walls with taupe trim warm this model home and balance the gray upholstered pieces. 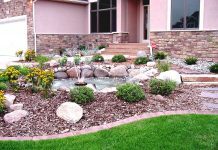 The home is inviting and visually spacious with the perfect balance of neutral tones. The gray stone of the fireplace surround further enhances the space and provides wonderful texture to complement the ceiling beams. 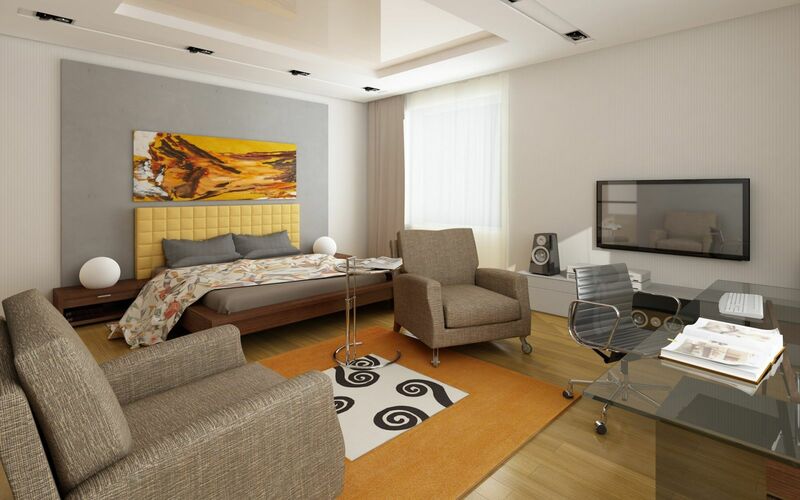 By adding small shots of color and black to this room, the gray and cream palette is given noteworthy background status. The black folding screens placed in the corners of the room define the space and add height. Beautiful shades of soft blue and natural green further augment the space, while various metallic pieces add interest and texture. 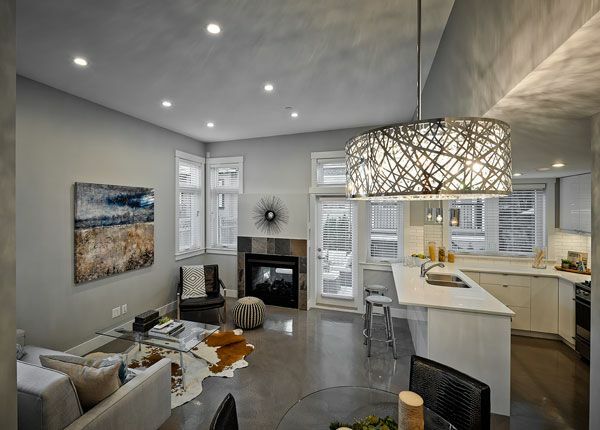 The cream cabinetry blends seamlessly into this gray open living space. 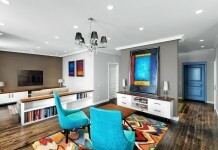 This is a great color combination for open floor plans, especially for subtle blending of distinct areas of the home. 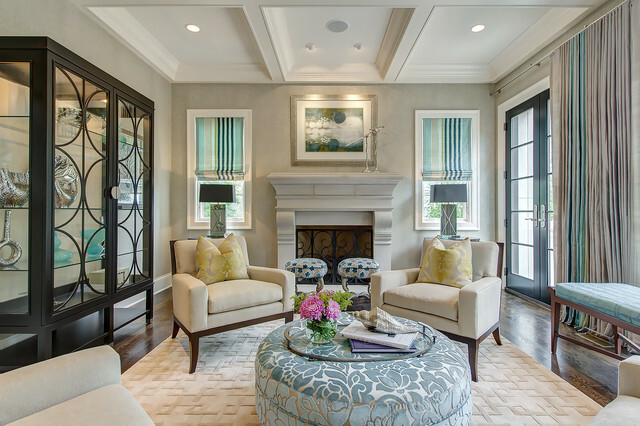 Adding pattern and color to a cream and gray scheme gives rooms character and dimension. 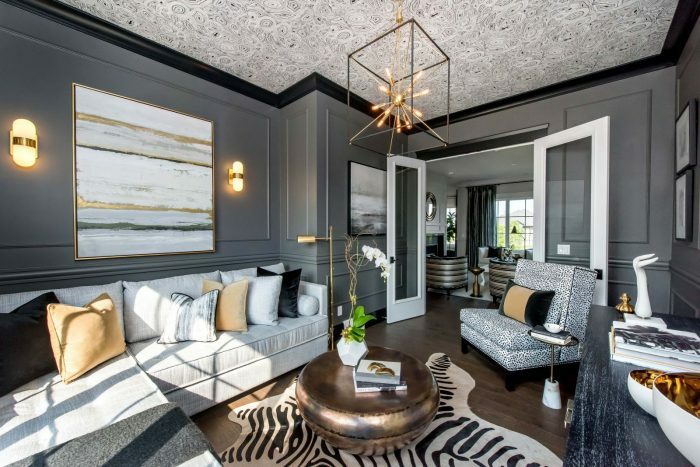 The zebra print rug and geometric print chair upholstery play well off the patterned ceiling in this room. The metallic table, accent bowls and light fixtures add warmth. A myriad of blues gives this room balance and interest. The colorful rug anchors the room, while zebra print pillows and striped window panels lend interest and texture. Beautiful soft colors make this room stand out with style and fresh sophisticated ease. 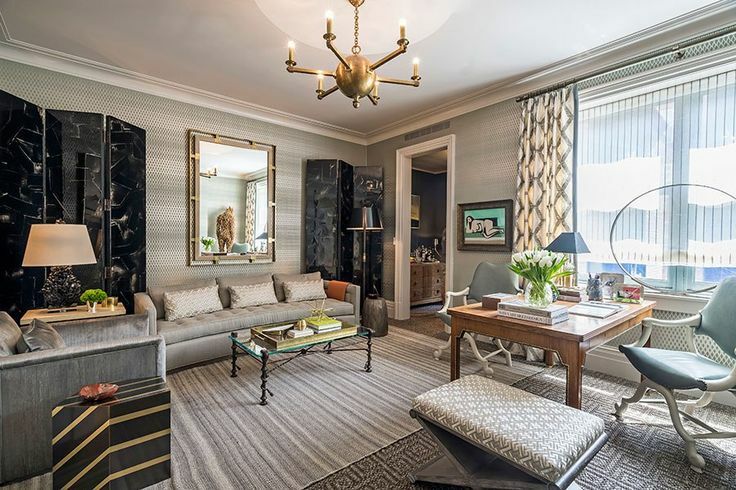 The casual elegance of this room is marked by lustrous fabrics and well-chosen accessories. 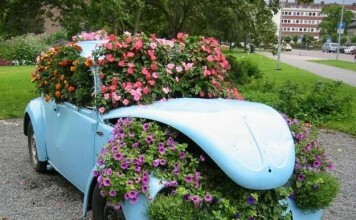 These give distinction to the beige-gray walls. The color combination of gray and cream is the perfect balance of cool and sophisticated. It is a palette that embraces the neutral scale in style. It is soothing and warm. Try a few of these ideas in your own home and see how this subtle blend gives your rooms elegance and grace. Next articleThe unusual dolls of artist Sandra Arteaga. Do you like them?